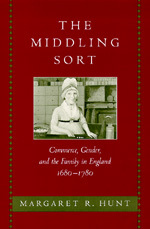 To be one of "the middling sort" in urban England in the late seventeenth or eighteenth century was to live a life tied, one way or another, to the world of commerce. In a lively study that combines narrative and alternately poignant and hilarious anecdotes with convincing analysis, Margaret R. Hunt offers a view of middling society during the hundred years that separated the Glorious Revolution from the factory age. Thanks to her exploration of many family papers and court records, Hunt is able to examine what people thought, felt, and valued. She finds that early capitalism and early modern family life were far more insecure than their "classical" models supposed. Commercial needs and social needs coincided to a large extent. The family is central to Hunt's story, and she shows how financial struggles brought conflict, ambiguity, and tension to the home. She investigates the way gender intertwined with class and family hierarchy and the way many businesses survived as precarious successes, secured through the sacrifices made by female as well as male family members. The Middling Sort offers a dynamic portrait of a society struggling to minimize the considerable social and psychic dislocation that accompanied England's launch of a full-scale market economy. Margaret R. Hunt is Associate Professor of History and Women's and Gender Studies at Amherst College.